Arch smart device leaker Evan Blass has told his Twitter followers that Google will launch a Pixel branded smartwatch at its upcoming hardware event in autumn. 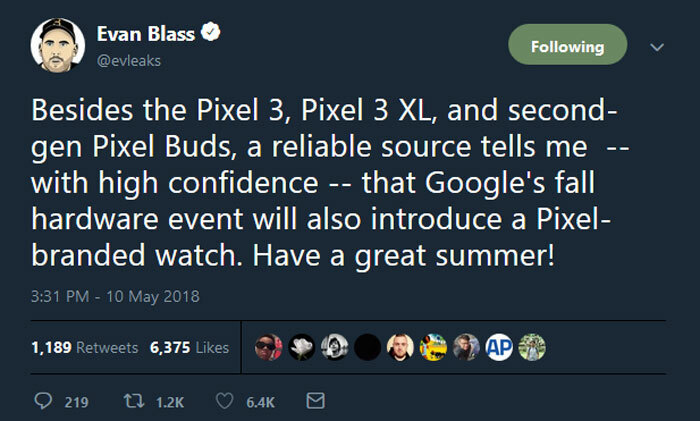 The watch, or watches, will arrive alongside Pixel 3, Pixel 3 XL, and second-gen Pixel Buds, it is said. According to Blass, the information outlined above comes from a reliable source in which he has high confidence. Blass himself also has a very good track record for unearthing such pre-launch information. It isn't much of a surprise to hear about the third generation Pixel phones being a feature of the upcoming hardware event. Google's Nexus and now Pixel branded phones have become ever more popular over generations and seem to be really gaining traction with the current Pixel 2 range. Another hardware update flagged for inclusion in the new hardware lineup are second-gen Pixel Buds. The first gen wireless headphones are rather attractive in form and function, and are priced at £159 here in the UK. They are said to offer good quality sound, touch access to the Google Assistant, touch sensitive audio controls, a microphone noise filter, and fast charging. Recent changes to the accessory software for the first gen pixel buds signal new features like the ability to customise the double-tap gesture, improve the notification experience on a per app basis, and in-ear detection. Probably the most interesting part of the pre-launch leak is the mention of the Pixel branded smartwatch(es). Google recently renamed Android Wear to Wear OS, and will at long last produce its own product. Last year a Google VP of engineering software indicated that Google itself must "advance the ecosystem." Let us wait and see if Google has the talent to popularise a wearable, where others have tried and mostly failed. German tech magazine WinFuture claims to have more info about Google smartwatches. It says there will not just be one Pixel smartwatch but three models. Code-named Ling, Triton and Sardine, they could be differently sized, or differ in some other aspect such as design, biometrics, or connectivity options.